$SPY broke over the 250 day SMA by .05 cents Friday. This is a bullish trend signal. $SPY had a bullish 10 day / 50 day EMA crossover on January 24th. The trading range continues to decline to a 4.05 ATR. A contracting price range is usually bullish as uncertainty and fear has declined. The $VIX closed under the 200 day SMA for the first time since October 5th which is bullish if it can trend lower beneath this key line. MACD remains under a bearish cross under. An RSI at 64.30 has room to go higher before becoming overbought. Volume last week was higher on up days than down days. The volume is healthy but below the 10 day average volume. There is still a lot of money on the sidelines from the high volume sell off from the 4th quarter of 2018. 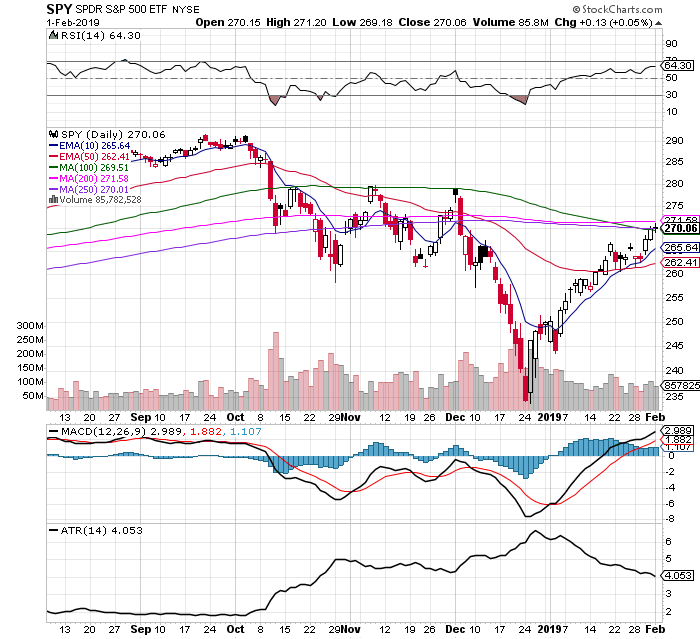 A break and close above the 200 day SMA would be the first step to a new bull market. A strong rejection there puts the odds of this move being just a swing higher inside a down trend back on the table. We are at a crossroads between the 200 day $SPY breakout and the $VIX 200 day SMA support. A break of these levels and trend could be the guide to the next market direction.